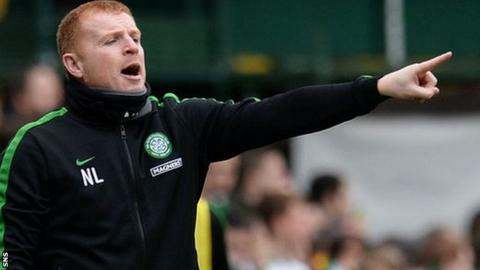 Neil Lennon will use Celtic's free weekend to look at players as he steps up his plans for next season. The Celtic boss saw his side cruise to a 2-0 win at Dundee United on Saturday, with Georgios Samaras and Anthony Stokes hitting the goals. And with no games in the Premiership next weekend due to the Scottish Cup semi-finals, Lennon will head off to scout potential signing targets. "I'll use that time to catch up on trying to see some players," he said. "There's going to be a little bit of surgery to be done on the squad and that's what we're aiming at now." The champions drew 1-1 with Ross County in Glasgow last week, and seemed determined to put on a better display at Tannadice against in-form United. First-half goals were enough to see off the Tangerines and Lennon was thrilled with his side. "It was a wonderful performance from start to finish," he said. "I thought the score-line should have been more emphatic, we were in total control. "We wanted to come here and put a marker down. There's been a lot of nice things said about Dundee United and their young players this year, and rightly so. It's the same with Aberdeen and other teams, and I think people take Celtic for granted, but I don't. "I told that to the players before the game and afterwards. They were fantastic today. Our fans come in their thousands and we had to make sure that they went away happy, that's important. "Sometimes you don't want the first half to end and we didn't really hit the ground running in the second half," added Lennon. "We had to ride out a little bit of pressure from Dundee United and once we did that, on the counter-attack we were fantastic. "But for a little bit more care we'd have won the game by three, four or five. The football we played at times was exhibition stuff."